Ivermectin belongs to the family of avermectins, which are obtained by fermentation of Streptomyces avermitilis. It is effective against nematodes (roundworms) and arthropods (arthropods) by inhibiting the transmission of impulses between nerve cells or between nerve and muscle cells. The parasites are paralyzed and eventually die off. Ivermectin does not work against flukes and tapeworms. Ivermectin is characterized by a high margin of safety and has no apparent effect on mammals, since it does not reach the central nervous system due to the blood-brain barrier in the rule. 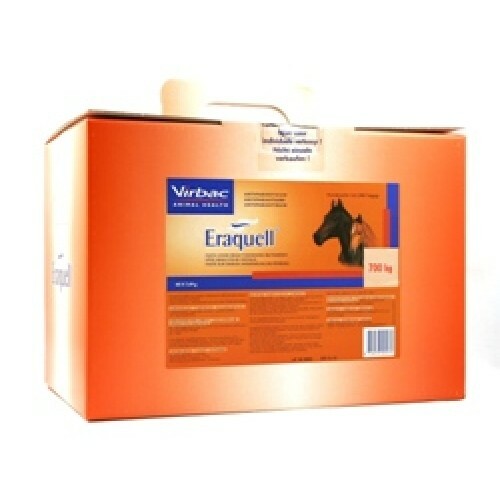 Eraquell is highly effective at the recommended dose in the horse against the following parasites: Large strongyles: adult worms and arterial larvae of Strongylus vulgaris, adult and Gewebsstadien of S. edentatus and adult forms of S. equinus. Small strongyles - including benzimidazole resistant strains - (adult and immature forms): Cyathostomum spp Cylicocyclus spp Cylicostephanus spp Cylicodontophorus spp Gyalocephalus sp..... and Triodontophorus spp. Pfriemschwänze (adult and immature forms) Oxyuris equi; roundworms (adult and immature forms) L3 + L4): Para equorum; hair worms (adult form): Trichostrongylus axei; stomach worms (adult form): Habronema muscae; filarial worms (microfilariae) Onchocerca sp. Warble fly (oral and gastric stages): Gasterophilus spp. Lungworms (adults and immature forms): Dictyocaulus arnfieldi; dwarf roundworms (adult form): Strongyloides westeri; skin dermatoses by larvae of Habronema and Draschia spp. (Summer sores) and microfilariae of Onchocerca species (cutaneous onchocerciasis). VetVigilance: Pharmacovigilance / vaccinovigilance message reimburse filarial infections in horses with severe swelling and itching were observed in response to treatment with Eraquell (microfilariae Onchocerca sp.). In these reactions, it is most likely the result of a massive dying of microfilariae. Symptomatic treatment is recommended under certain circumstances. To troubleshoot summer wounds with extensive tissue changes in addition a suitable treatment with the application of Eraquell is required, among other things. Also, the possibility of reinfection or measures are appropriate prophylaxis should be considered. Eraquell pastes can be administered to pregnant and lactating mares, the reproductive performance of stallions is not adversely affected. Horse: edible offal: 14 days. Keep all medicines out of reach of children. Not above 25 ° C, protected from light. Grace period after opening the package: 6 months at room temperature (15-25 ° C). The medication should be used only until the designated date on the container with EXP. Ivermectin is excreted mainly in the faeces of treated animals after oral administration. Studies show that ivermectin is tied after excretion to soil components and slowly release that a relevant transition is not expected in the waters. Since free ivermectin for fish and some can be dangerous aquatic organisms, containers and drug residues should be destroyed. Eraquell is for oral application. It is administered at the recommended dose of 200 micrograms ivermectin per kg body weight. The first mark on the piston of the applicator emits a sufficient amount of paste to treat 100 kg of body weight. Each additional marker corresponds to a dosage of 50 kg body weight. Using the applicator to 6.42 g (120 mg ivermectin) resp. to 7.49 g (140 mg ivermectin) can exceed 600 kg body weight and the recommended dose. 700 kg body weight can be treated. Loosen knurled ring a quarter turn and push up piston shaft so that the inclined toward the piston side of the ring is at the height of the prescribed weight marking. Knurled stop with a quarter turn back. Remove the plastic cap from the tip of the mouthpiece. Check that the horse has no more food in his mouth. Insert applicator into the horse's mouth. Advancing piston as far as possible and settle drug in the tongue base. Immediately after use to hold up the horse's head for a few seconds. All horses should be included in a regular parasite control program. Mares, foals and annuals is to pay special attention. In foals, initial treatment is between 6 and 8 Week of life, the routine treatment then repeat as required to perform. Eraquell is highly effective against gastrointestinal nematodes and warble fly in horses of all ages. The regular treatment reduces the risk of the emergence of verminosa arteritis and colic due to S. vulgaris. Thanks to its wide spectrum Eraquell is well suited as the main component of an alternating treatment program.